We at Costa Blanca Green Fee Services are always looking for opportunities to extend the range of services to our clients and with this in mind we have established a partnership with a master craftsman with many years experience in club repair and re-gripping on the Costa Blanca. 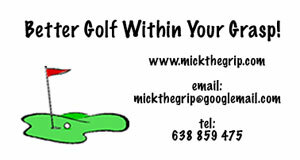 Michael Reeves (known locally as 'Mick the Grip') is resident in Villamartin and offers a full range of club repairs and a 'mobile' re-gripping service. a) New grips save 3-4 shots per round. b) If your grip is too small this results in a hook. c) If your grip is too big this results in a slice. d) A confident relaxed grip promotes proper swing mechanics. e) Worn grips can cause arm and wrist tension. f) Professionals advise a change of grip after every 40 rounds. A standard range of iron,wood and putter grips are held in stock from Golf Pride, Wynn, Lambkin, Sharpro and Avon and they can specially order grips from Callaway, Ping, Taylor Made, Cobra, Nike, Mizuno, Cleveland and Odyssey. 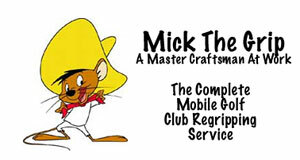 The re-gripping service offered is fully mobile and they will come to your home or meet you at the golf course. We at Costa Blanca Green Fee Services have always provided a local club hire services on a relatively small scale but we are delighted to announce that we now work with and recommend an established company in the golf industry called ClubsToHire. ClubsToHire was launched in 2010 and have a number of outlets in Europe, America and now the Costa Blanca in Spain offering clients an alternative to the costs and hassle in bringing golf clubs on flights and through busy airport terminals. They offer top quality branded golf clubs for hire from as little as €35 per week and can meet you at your arrival airport or by arrangement at the golf courses and all at affordable prices when compared with the costs from airlines for transporting sports equipment these days. To contact ClubsToHire simply click on the banner below and obtain your personal quotation today.